We have just designed and produced a suite of promotional material and branded merchandise for Gatwick Airport in line with the European Safety Awareness Week (this week!). We have developed the brand – Think Smart – which umbrellas the existing ‘Smart’ brands we have previously developed for the airport (Trolley Smart, Baggage Smart and Electric Vehicle Smart). 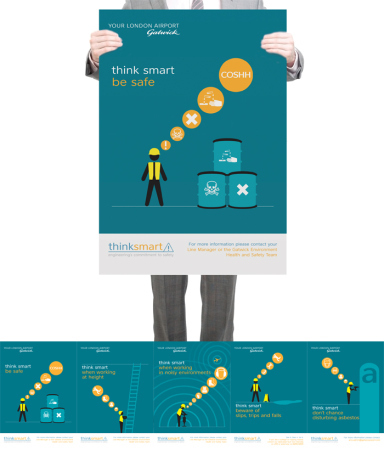 Following Gatwick’s new corporate guidelines, we created 5 designs for A3 posters to promote the Health & Safety Executive’s national campaign within Gatwick Airport. Through the use of icons and illustrations we created a fun and eye catching way of raising awareness of the importance of considering health and safety risks while at work. Messages include; beware of slips, trips and falls, safety when working at height and safety when working in excessive noise. We also produced a range of branded merchandise to promote the campaign – including USB memory sticks, tape measures, snap bands and badges. 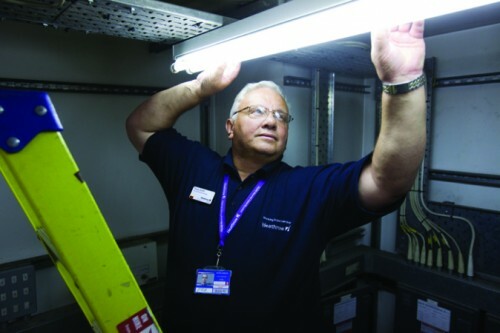 We’ve had a great deal of involvement in all of Heathrow Airport’s communications, so when we were asked to co-ordinate and direct a series of photo shoots for the company we leapt at the chance. The brief was to capture its staff in their working environment, and that is exactly what we’ve been doing! So far, as well as getting a lot of great images, we’ve also had a really fun few days out on the shoots. Say cheese! We are excited to have just completed our first project for the University College Birmingham. We were asked to pitch for the design of a new brochure for UCB’s two public restaurants. Our cost effectiveness won us the project. The brochure will be used to advertise UCB’s restaurants to the general public. 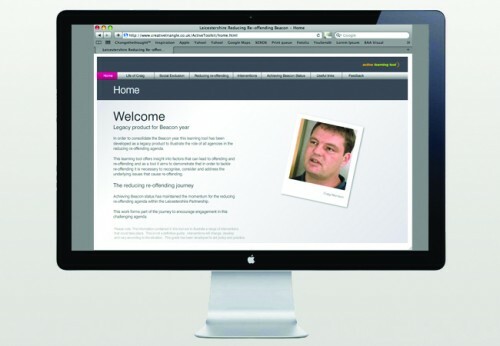 The brief was to create a brochure that emphasised the restaurants’ quality, value and variety. Using images of the students at work and taster menus, we designed a brochure that illustrated the restaurants’ professional status.